This slim metal light is small enough to carry anywhere while you are underwater, yet it packs a 650-lumen LED, making it bright enough to use as a primary source. Tap the recessed power button to access high, low, and SOS modes, and notice the switch surround lights up with a built-in power indicator. A flat tail cap allows the light to stand up for area lighting if needed. The Genesis is powered by 2 CR123 lithium batteries, which cope better with cold temperatures than alkaline cells. Battery Power Meter: The battery power meter provides continuous feedback on the condition of the batteries, indicating high, medium, or low battery life. This information allows you to make educated decisions about changing batteries or packing a spare set. Focused Narrow Beam: This pattern creates a long, powerful beam of light excellent for illuminating distant areas, or for use during fast-paced activities. IPX8 Dive-able lights provide waterproof integrity for continual submersion in water at depths down to 100 meters. If Atlantis had flashlights, they would be IPX8. Maxbright LED: The highest-quality LED available, Princeton Tec’s Maxbright LED is extremely bright and efficient. This single LED emits a smooth, powerful white light useful for a wide range of tasks. 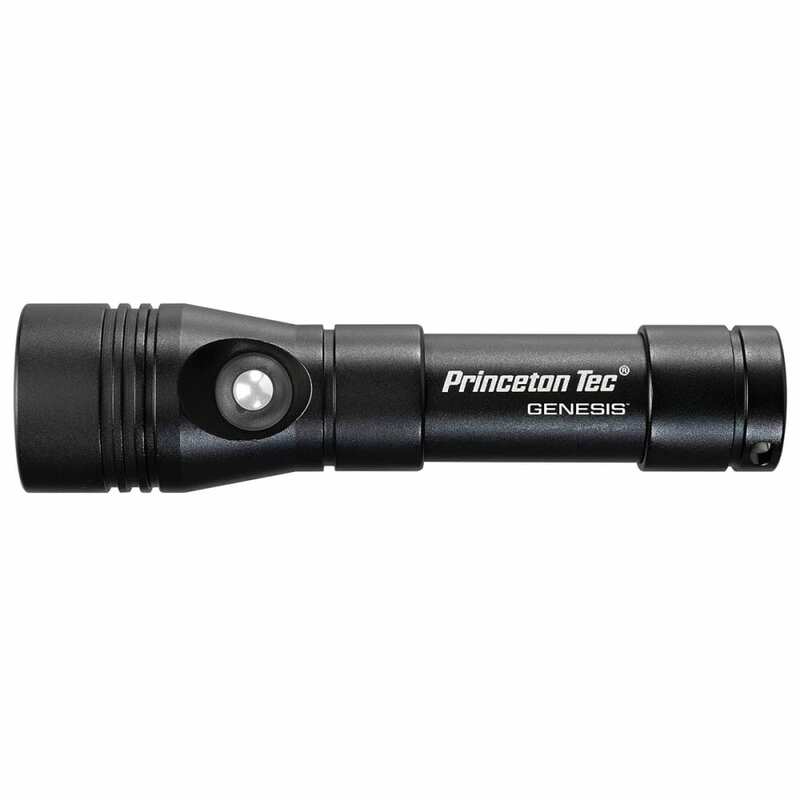 Princeton Tec uses collimators or reflectors with the Maxbright LED, depending upon the application. Please note: The Genesis is designed primarily for underwater use, and as such, Princeton Tec recommends against extended use topside, particularly in high ambient temperatures. Weight w/ Batteries: 5.5 oz.